The cultivation of shiitake mushrooms on oak logs has been practiced for centuries in China, Japan and Korea for hundreds of years. -inhibiting the growth of cancer tumours. 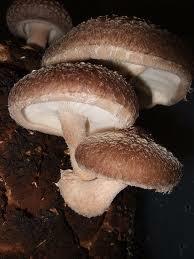 -Shiitakes currently retail in supermarkets for around $50/kg. -Around $35 per kilo in the Melbourne wholesale markets. -Ideal size – 10-20cm diameter x 1 meter long. -Over watering can encourage the growth of Trichoderma fungi. To fix, simply let the surface dry out (i.e. stop watering). Mycelium decomposes the sapwood in logs. The mycelium travels longitudinally through the log. -Small mushrooms will start to form in a few days…. and are ready for harvest in around 10-14 days. Slugs- You must protect the mushrooms from slugs with some type of material. Trichaderma- If you notice trichaderma fungi it means you have over watered. To rectify, simply stop watering and let logs dry out. Drying out- Mushrooms can crack on the surface if they dry out (this can be desirable to some extent). A Microwave ( I zap bags at full power for 20 minutes, 3 times, 12 hours apart) or big pot with a lid (simmer for 6 hours) will also work, but not as efficiently. Many grains have been used to cultivate mushrooms, or more specifically, mycelium. Some growers use grains as their fruiting substrate, but most use grains to generate spawn, which is then added to a bulk substrate like straw, coir, sawdust or woodchips. Grains are useful because they are very nutritious, readily available, and easy to handle. I have personally used Milo, Popcorn, Maize, Wheat, Oats and Wild Bird Seed. I have read of others using Ryes, Millets, Sorghum…use what’s cheap and available. We need to soften the grains-this is done by soaking in water, and/or cooking them. You’re after the same consistency as cooked brown rice. The longer you soak them in water, the less you have to cook them prior to sterilizing. If you soak for 48hours or longer, there is usually no need to soften them further by cooking. Gypsum can be added now, at 5-10% of the dry weight of the grains. I sprinkle the gypsum straight on top of the grains, then mix in by hand. Gypsum provides calcium and sulphur, and also helps stop the grains from sticking together. Grains for spawn production are usually sterilized, using heat. A pressure cooker comes in handy for this, as they can reach over 120 degrees Celsius, and efficiently sterilize. The softened grains are loaded into bags or jars, leaving room for the spawn you will later add. Pressure cook for 2 hours at 15psi. Allow at least 6 hours for you grains to cool prior to inoculating with spawn.